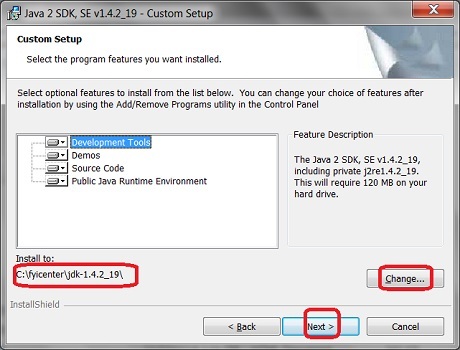 How to download and install JDK (Java Development Kit) 1.4? 1. Go to Oracle Java Archive Website. 2. Click "Java SE 1.4" link. You see the "Java SE 1.4 Archive Downloads" page. 3. Accept the license agreement and click "j2sdk-1_4_2_19-windows-i586-p.exe" in the Windows Offline Installation line. 4. Login with your Oracle account (or create one, you don't have one). 5. Save the download file to C:\fyicenter\j2sdk-1_4_2_19-windows-i586-p.exe. 6. Double-click on C:\fyicenter\j2sdk-1_4_2_19-windows-i586-p.exe to start the installation. You see the JDK 1.4 installation wizard screen. 7. Change the "Install to" directory to C:\fyicenter\jdk-1.4.2_19\. 8. Click "Next" button to finish the installation. 9. Verify the installation with "java -version" command. Download and installation of JDK 1.4 is done.